Finally, after a bit of delay, the second half of Charlie Button’s adventure. When last we left young Charlie and his companion Pwilfred the ogre, they were wandering about the Forest of the Lost, a place on the underside of imagination full of socks, keys, and guitar picks. For the first half of the story, go here. Now, the exciting conclusion. Her slippers were silver, and her hair like spun gold. She wore a silken gown embroidered with the finest lace, wrists and throat glittering with shining jewels. She was a princess; a real princess, like in all the stories. My breath caught in my throat, and Pwilfred and I watched raptly as this lost princess wandered through the shaft of light. Then a small pile of travel toothbrushes gave way beneath her dainty silver slipper, and she tumbled to the ground. We heard her voice then, the sweet tones of an angel, but her words… Even the trees blanched a bit at those words, the air itself wincing as it reluctantly carried her profanity to my ears. She waved off Pwilfred’s attempts to help her up, but I felt it best to advise her. “Princesses,” I said in my most authoritative tone, “Do not curse.” Her reply was equally unprintable. Despite being at odds, I felt that we should take her with us. Even a cursing princess shouldn’t be consigned to a land where the only jewelry available was assorted watches that had slipped off assorted wrists, and where she was in constant danger of the imminent arrival of baseballs. 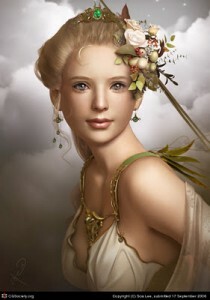 “Have you perchance seen a door, your highness?” I inquired gently, so as not to rouse her ire. “Pwilfred has an invitation to the House of Doors, and it will take us away from here, if only we can find a door.” I sounded hopeful, but in truth I hadn’t the slightest idea if it would work. It seemed as reasonable as anything else about, but that wasn’t saying much. “City?” I couldn’t help myself. What manner of careless person loses an entire city? “The city,” She pointed past the trees, toward a gentle slope. I thought very hard about repeating some of her earlier words. “You never mentioned a dragon.” I’d gotten this far with very little danger, and had hoped to be home for dinner without further incident. That did it. I could handle articulate ogres, cursing princesses, mysterious invitations and forests full of lost receipts and puzzle pieces, but the notion that the majestic dragon was some sort of large migratory bird was patently ridiculous. “Dragons,” I took a deep breath, incensed “Do not fly south for the winter.” The words echoed past the archway, resounding in the theatre beyond. Given the low growl from up ahead, she was quite correct. It stole into view slowly, its tawny shape detaching from the shadows. Gleaming red eyes bored into me, and its spined tail whipped back and forth as it crouched between two stone benches. We did the only sensible thing to do. We raced down the stairs, the beast at our heels every step of the way, slavering and snapping at the princess’s gown. We scrambled up and over the dragon’s hoard, through shiny buttons, earrings, and lost wedding bands that smelt of dish soap, hurtling toward the great iron door that stood on the stage. And then the unthinkable happened. I fell. Reaching out for something to steady myself with, I grasped a rusty spear that stuck out from the pile like a naked flagpole. 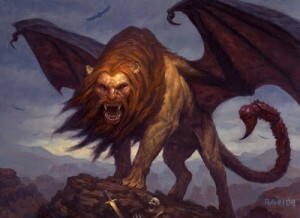 I heard the great roar of the manticore as it pounced, and heard the roar cut short, dwindling to a strangled gurgle as the beast’s body slid down the spear. Its life’s blood flowed ahead of it, staining my hands, and my fear faded into something resembling pity. It was a beast, a monster, but it had only done what was in its nature to do. Of all the strange things here, it was the only one which acted as expected, and now I had slain it. Pwilfred’s mighty arms hauled open the door as I stood utterly still, as transfixed as my victim. The princess led me away without a word, and as we stepped into the House of Doors, my dismay was overtaken by my confusion. There were doors of every kind everywhere. Large and small, plain and ornate, they weren’t just on the walls, but in the floor and on the ceiling as well. It was only when the princess found the door to her castle’s pantry that we realized this was goodbye. I would miss her company, despite her proclivity for foul language, and my cheek is still a little warm where she kissed it. The very next door led to my own bedroom. It was time to go where all good adventures end. Home. I shed manly tears when parting with Pwilfred. He had been a good companion, and without him I would have never have come this far. Still, he couldn’t stay, not even to visit for dinner. He was late as it was, and besides, my mother’s fruit was vile. I forgave him that remark, and crossed the threshold. I walked immediately to my desk and seized my list, crumpling it in one hand. It was a foolish ambition, the desire to chronicle fantastic adventures with brave heroes and boon companions. Now that I had endured an adventure of my own, I knew there was no glory in it, no fun, only the fear of loss and the pain of parting. I reveled in my newfound cynicism and maturity, but for a moment I dared to dream, and a little smile crept across my face. My fingers smoothed the page. Cursing princesses, I wrote. This story submitted with the express permission of Henry Shakespeare, Esq.